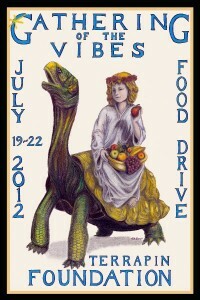 1) Any person that makes a donation of 20 items or more towards this year’s drive will receive a complimentary limited-edition Gathering of the Vibes Terrapin Foundation food drive poster. Only one poster is allowed per total donation. Any donation of “quick noodle” products such as Ramen Noodles or Cup-o-Noodle will be discounted. Five (5) “quick noodle” packages will be considered one (1) item. Any single item weighing over 5 lbs. will be counted as two (2) items. 2) The person that makes the largest donation by weight towards this year’s drive will win two (2) complimentary VIP tickets to the Gathering of the Vibes. 3) Any person that makes a donation of 50 lbs. or more towards this year’s drive will become eligible to win two (2) complementary regular camping tickets to the Gathering of the Vibes.